CE Classification: A. Home Port: San Diego, California. As valued by BUCValu (dealership resource), vessel has retail value of $136,500-$150,000, plus 15% added value for excellent condition. New replacement value is $175,000 - $195,000. Fresh-water cooled engine. 3-blade propeller. Interior with teak paneling, white overhead, dark blue upholstery, teak and holly sole. Salon includes U-shaped dinette with settee and L-shaped galley. Aft-facing navigation station/table. Entertainment systems include 19? Magnavox flat-screen TV with DVD player; Sony stereo FM/AM with CD player (speakers in cockpit and salon). Two staterooms plus salon ? combined will sleep total of seven. Master stateroom features an aft cabin queen bed. Guest quarters features a forward V-berth. Starboard settee and dinette table makes into a double bed. Port settee converts to a single berth. Electric fresh-water toilet (no more smelly heads), with adjoining step-in shower with glass door, and roomy vanity area. Open L-shaped galley, aft of salon to starboard, features a Corian countertop space with abundant shelves, lockers and drawers. Double stainless steel sinks, 2-burner stainless steel propane stove with oven and microwave. Adler Barbour refrigeration with two counter top accesses, hot & cold pressurized water system. Seaward S600 water heater. Raymarine colored C70 multi-function instruments (chart plotter & radar), Raymarine 24-mile radar. Raymarine ST60 instrument package includes wind, speed and depth. Autohelm 4000 autopilot. Danforth Corsair III compass and ICOM ICM402 UHF radio. Totally integrated systems ? tracks GPS settings. AC system: 30A/125 V inlet to port on transom, 110-120 V system. DC system: batteries 2-12 V, 12-volt system, with battery switch below chart table. Potech 4-battery charger. One aluminum deck stepped mast (two piece mast) manufactured by Selden, sloop rigged. Lazy jack system for main sail including sail cover (easy up & down of main sail). Main sheet traveler on stainless steel radar arch. Selden rod kicker boom vang. 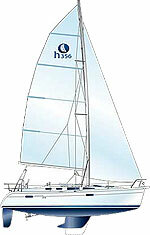 ProFurl roller furling head sail assembly, two Lewmar 30 self-tailing and two Lewmar 40 self-tailing winches. 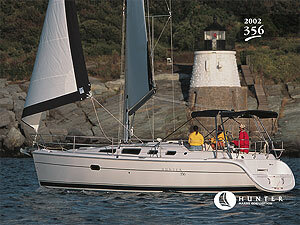 Main sail is 721 sq.ft of sail area, full batten, with easy to use small fraction rig roller furling jib. All lines lead to cockpit for easy sailing. Walk-through transom with two storage compartments with fold-down swim ladder. Cockpit has canvas dodger and bimini top, with cockpit deck cushions. Huge under seat storage compartment. Cockpit speakers, table, stern rail seats, rail-mounted propane BBQ grill. Spreader lights for deck. Trad 22 anchor, chain and line rode with Lofrans Marlin 2-direction electric windlass. Automatic and manual bilge pumps, engine compartment blower, emergency tiller, fresh-water electric head, digital tank level indicators, manual fire extinguishers, fresh water stern hot/cold shower. 6-HP 4-stroke Tohatsu outboard engine with inflatable dinghy. USCG approved safety equipment (flares, air horn, lifejackets, etc), 3 CO alarms, Life Sling rescue kit. Portable fans and heaters (3). Kitchen and cabin essentials provided. Bring only your food/drinks, bed linens/towels and personal items - you are ready to go.